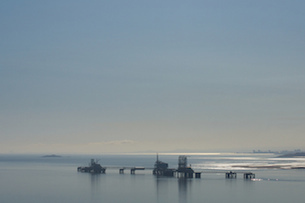 Can George Osborne save North Sea oil? The industry would welcome a pre-election tax cut, but that still may not save investment with oil below $50 a barrel. North Sea oil bods have been making increasingly dire pronouncements about the fate of their industry as Brent Crude languishes below $49 (£32) a barrel - and it looks like chancellor George Osborne has been listening. North Sea producers currently pay a tax rate of around 60%, with a so-called ‘supplementary charge’ on top of the usual 30% rate of corporation tax. Osborne hiked that by 12% to 32% back in 2011, when oil was selling for more than $100 a barrel. He cut that by a mere 2% in December’s Autumn Statement, which industry figures unsurprisingly said was nowhere near enough, given oil had plunged by around 57% since its most recent high of $115 in June. The North Sea currently supports around 375,000 jobs, but that was already set to fall by 35,000 in the next five years, according to an Oil & Gas UK and EY report released in early December when oil was above $60. Since then, companies including Shell, BP and American firm ConocoPhillips have announced job cuts in the hundreds and more than half of the North Sea's untapped oil fields are currently economically unviable, according to consultants Wood Mackenzie. Clearly a tax cut would help the industry. It’s an easy pre-election giveaway for Osborne, particularly after the Government estimated the oil price slump had eaten a £18.6bn black hole in the Scottish nationalists’ post-independence tax projections. But then again, the chancellor will know that even a windfall is still unlikely to add to the Tories’ single Scottish MP. More importantly, it may not bring investment back on tap. It is expensive to shut down production entirely, but the UK only has an estimated 30-40 years of oil left. With many more longer-life fields still to be explored around the world (although many in expensive-to-reach deep sea locations), and prices this low, companies don’t have a particularly compelling reason to keep on investing in the relatively ‘mature’ North Sea.